(JULY 17, 2018) ZAPATA, TEXAS - IBC Bank-Zapata Chairman of the Board Renato Ramirez and IBC Bank-Austin CEO and President Robert Barnes provided the mariachi program at the University of Texas at Austin with two large checks, one from IBC Bank in the amount of $100,000 and the other from R & P Ramirez, LTD for $125,000. Ramirez engaged in a fund-raising program in the fall to assure sustainability of the Mariachi program at UT. 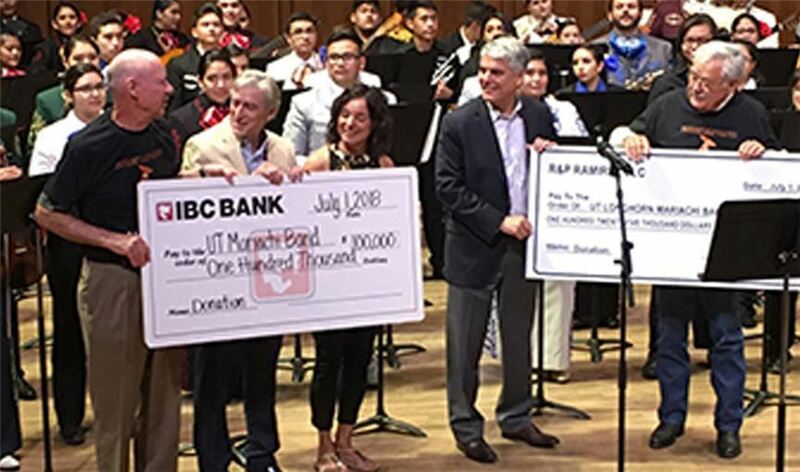 IBC Bank and Ramirez lead by example with their respective donations and encouraged others to donate, resulting in a five-year commitment that will generate $750,000 for the mariachi program. Ramirez noted that this was a very important moment in the trajectory of the UT Longhorn mariachi program. Zeke Castro, age 79, is retiring after many years with the UT Butler School of Music (BSOM). Ms. Monica Fogelquist, a noted first violin and first vocalist for mariachi programs in California and Nevada, has been named the new director of the UT mariachi program. "It is important to increase recognition of mariachi as a key part of Texas music culture," said Ramirez. "By helping the mariachi program at UT Austin, we hope to reach a wider audience and allow students bigger opportunities outside their local towns." IBC officers throughout Texas encouraged high school students to participate in the program. As a result, this summer's Longhorn Mariachi Camp was filled to capacity. UT President Greg Fenves thanked Mr. Barnes, IBC-Austin and Mr. Ramirez and his wife for their generosity and passion for mariachi music. College of Fine Arts Dean Doug Dempster, BSOM Director Dr. Mary Ellen Poole, Dr. Ernest and Sara Butler, whose historic donation resulted in the school of music being named the Ernest and Sarah Butler School of Music, along with state representatives Tracy King and Richard Raymond, were also present.